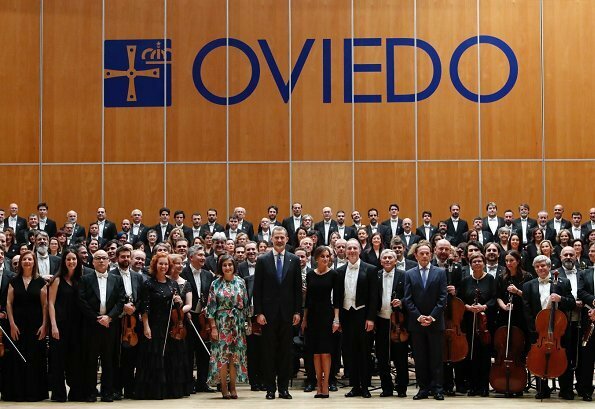 On October 18, 2018, King Felipe VI and Queen Letizia of Spain attended the 27th Princess of Asturias Awards Concert held at the Prince Felipe Auditorium in Oviedo, Spain. The concert was organized by the Princess of Asturias Foundation and is the opening event for the Princess of Asturias Awards. Like the interaction between these two in these photos. The dress is smart but dull. Hair and makeup beautiful. The details of the dress are lost in the color but she looks fabulous as usual. The glow of the earrings from the flashes of the cameras are a clear sign that those rocks/buttons are real. We are aware of the minimalist styling, but a thin necklace with some sparklers would not hurt. No estoy de acuerdo. Letizia lleva las pulseras gemelas de Cartier de Victoria Eugenia. Es más que suficiente con los pendientes de chatones. Si se pone más joyas parecería un árbol de Navidad y no sería ella, sería "otra"
A Letizia no le gustan ni los collares ni los anillos. Las únicas joyas que suele llevar son pendientes y a lo sumo pulseras. MarigoldB, I so agree with you, I very much miss a string of pearls on most of the European royal ladies, and to think they have so many jewels. "The cherry on the cake" for me is pearl chokers, I miss it dearly, but okay, times have moved on, so a string of pearls can't be to wrong, can it? I agree with Angie. She is beautifully accessorized. To suggest that she weat pearls or a brooch is suggesting she dress like Queen Elizabeth. En España los collares están relacionados con la mujer del dictador Franco, era llamada "Carmen collares"....Las perlas son de señora mayor.. I like it so much that there is a lovingly interaction between King and Queen. Why not? IMO they are first people like you and me and they are allowed to show emotions for each other. That is sympathetic! This interaction often is missing drin Kate and William. This is a pity because they are such a nice couple. Showing emotions for each other Like Harry and Meghan or other Royals make less aloof and nevertheless they all do the royal job great and wonderful. One does Not exclude the other I think. Q. Letizia Looks stunning and wonderful. Love her hairdoo and dress. I totally disagree as for "showing emotions". Not all people are the same, luckily, and not everybody likes to show their emotions constantly. Some people are more reserved, but that does not mean they do not have emotions. I for one like the more reserved behaviour of Letizia. It suits her. Great combination: dress, shoes, hair, jewelry. Simply beautiful. I like the dress, the jewels, hair and makeup...However, I would love to see one broach on the dress. But as always she looks very well. I like the dress, jewels, shoes, hair and makeup... however i would love to see a small broach, not a necklace(too much), but something more on their chest. But as always she is super! I like this new dramatic style with heavier make up what Letizia has lately had. Suits her so much better than the artificial teenage look she sometimes has. Black dress is also nice and elegant. Great Armani dress. The earrings are very special. Very elegant. Me encanta este vestido. Pero me gustaría usara más broches y collares modernos. I really like the idea of royalty keeping their look more simple with their clothing and jewelry, especially the younger royals. It keeps them more relatable to the public. I also enjoy see royal couples showing affection for one another. After generations of arranged marriages, how nice to see genuine love.